My name is Joey Miller, and about six weeks ago I decided it was time to change my life style. Pressures of my job responsibilities and active church and volunteer commitments left me little time to to exercise regularly and get my erratic eating habits under control, or so I thought. I had allowed myself to gain weight over time and and my energy levels were were noticeably dropping. When I tipped the scale after the holidays at over 250 pounds I realized that enough was enough. 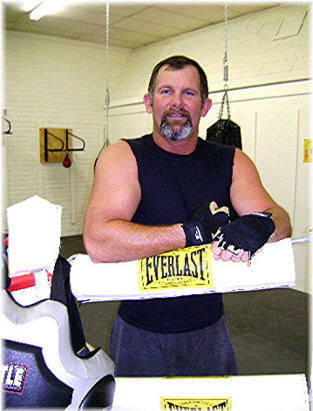 The best thing I did was talk to Coach Karpel at the Newton Gym and Boxing Club. From the time I walked in the Club I felt right at home. Coach Karpel and Coach Barrow helped me decide what program was best for me to start with. These folks treat you like family and they are great motivators. If you have any problems with soreness or pain and they don’t know the answer, they will go to great lengths to find answers as they have personal contacts with sports medicine experts and professional strength and conditioning college football coaches. Does the program they designed for me work? Well, I chose to follow their nutrition and exercise programs and stick with it ... it DOES work! The first thing I did was to change my eating habits, so I started eating the right foods and the right portions. I dedicate just 4 days a week for about an hour an evening to working a group session with weight resistance stations and cardio drills. In seven weeks I’ve lost over 25 pounds and I have gone from a size 36 pants, that were very tight, to a 33 and they are getting loose. I feel better, have 100% more energy, getting healthier and look better. I can’t say enough about Newton Gym & Boxing Club and their volunteer staff. It’s just a good place be ... a life changing experience!